Gunslinger Trials is the fourth of five DLC packs in the Defiance season 1 pass, and if there is anything that this season has taught me, it is that the Defiance team has mastered the art of recycling on a level that would make Al Gore cry tears of pride. That being said, coming out of the 7th Legion release, a package of DLC so devoid of content that the feature page has to scrape at the bottom of the barrel just to come up with four points of interest, there was almost no way that Gunslinger Trials could come off as anything other than the silver lining on this cloud of disappointment. 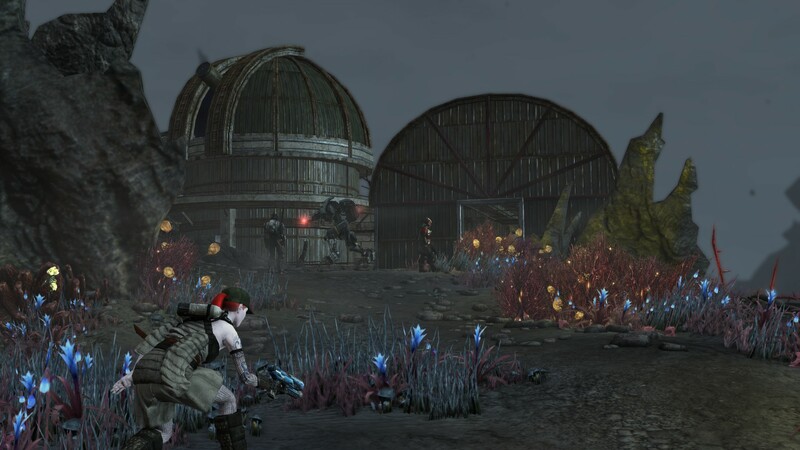 Defiance’s new DLC: Gunslinger Trials is the first content pack to expand upon the storyline following the disappearance of Von Bach at the end of the main mission series. The actual story progresses nowhere, but you get to meet three Von Bach Industries and take on a series of missions recovering things and ensuring that technology doesn’t get into the hands of raiders and other ne’erdowells. Ultimately the missions serve as an extended tutorial to get you to play each of the game’s nine new arenas. I hesitate to call them arenas, despite the game calling them so, because the name implies a relation to the Thorn Liro arenas which are horde mode encounters. The new arenas are recycled maps from the instances we’ve all been playing but with a change in enemies and objectives. The tweaking of arena scoring has made cooperative play more rewarding at the cost of severely inhibiting players who solo the Gunslinger and Thorn Liro arenas. While playing through the Gunslinger missions, I managed to barely scrape by bronze on most arenas while playing solo and, in most cases, sticking around as long as possible to wait for enemies to respawn. The addition of a new death tax that swipes points by the thousands for dropping, reviving, and evacuating has left certain features like the Warmaster boss rendered pointless. One of Gunslinger’s highlights is the addition of a new line of weapons available to those who purchase the DLC. These weapons can be obtained by opening gunslinger lockboxes which, thank god, are purchased using standard Von Bach Industries reputation points. Many of the weapons that I have come across offer the chance of initiating a special upon meeting certain requirements, like a sniper rifle that has a 30% chance of initiating cloak after a critical kill or a shotgun that can unleash overcharge if your shield breaks. Unlike previous weapon releases that were essentially small mods attached, the gunslinger weapons have the chance to change the way you play, allowing for players to utilize one static and two dynamic and less predictable specials at the same time. Ultimately, however, I have to say that Gunslinger Trials exceeded my expectations. The weapons are great, the arenas are fun even if they are recycled from existing dungeons, and the new scoring system shows promise but needs to be tweaked to get right. One suggestion I hope that Trion implements is the ability to enter public queues for gunslinger arenas along the same lines as the public groups for instances. Also the fact that you have to purchase the DLC to access most of the content, unlike previous DLC where the content has mostly been made available for free, also factors into this. For ten bucks, why not? This DLC was reviewed using the PC version. Your mileage may vary.